WWIV, Wildcat, Celerity — these hallowed names represent the best of a golden era of communication, back when “getting online” meant tying up the family phone line, remembering arcane Hayes AT codes to maximize performance out of the 9600 baud modem your dad borrowed from work, and TradeWars was the best multiplayer game available. Yes, I’m talking about Bulletin Board Systems, originally text based and later augmented with ANSI graphics. The first public BBS celebrated its birthday yesterday, and I think it’s a fair bet that few of us would be engaging in discussion today if it weren’t for that simple little computer bulletin board in 1978. Why even our esteemed leader John Biggs ran a bulletin board system for a brief while! I met a lot of really interesting people, and learned a lot of interesting things, as a result of my participation in BBSes around town. I never got into CompuServe or AOL or Prodigy — they were too corporate for me. I was more interested in the smaller BBSes hosted by people with interests similar to my own: science fiction and fantasy, the Rocky Horror Picture Show, and role playing games. I attended a couple of parties, picnics, and other social events coordinated by BBS users. Because the community of users was smaller — and local — there wasn’t nearly the prevalence of trolling or anonymous flamewars. 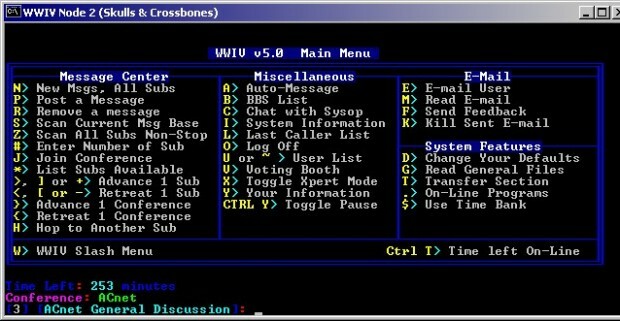 BBSes were a great way to connect, and communicate, with people. Of course, it was a simpler time back then. We weren’t bombarded with advertisements. There was no Flash animation. Heck, even downloading a low-resolution image of a pretty girl in a bikini took upwards of 20 minutes! There were no hyperlinks, no embedded images or videos: it was all text based, so there was a very real value to careful explication. The depth and breadth of discussion was often greater, with more personal insight and contribution (and sometimes BS). Generally we all knew one another, and welcomed new participants pretty quickly. BBSes exist in stark contrast to today’s web, where the regular participants on many big blogs drown out newcomers, the audience’s fixation on neophilia and the John Gabriel Greater Internet Fuckwad Theory prevail, and a pithy image or silly video can trump even the most erudite discussion. Thanks Wired for the trip down memory lane!